Kitchen– A gathering place for friends and family. A place where memories are homemade and seasoned with love. 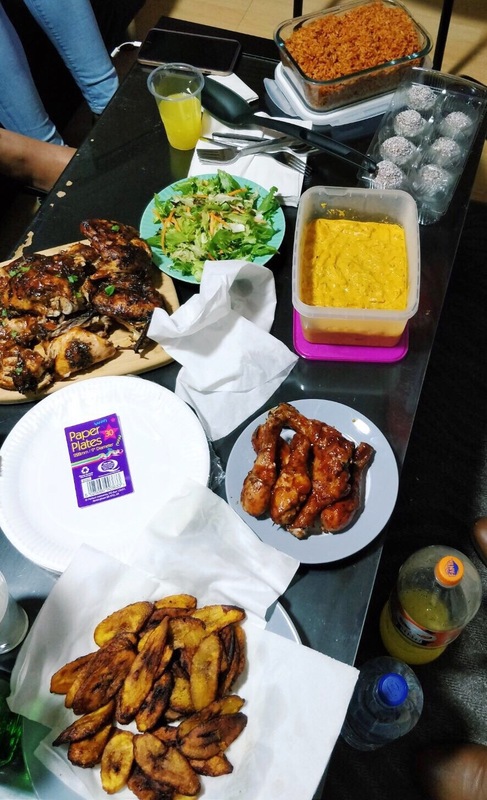 A couple of weekends ago I gathered my work colleagues and friends for a evening of good vibes and a random feast. They enjoyed it so much that all the food was demolished (including the chicken bones) and no leftovers was seen in sight lol. 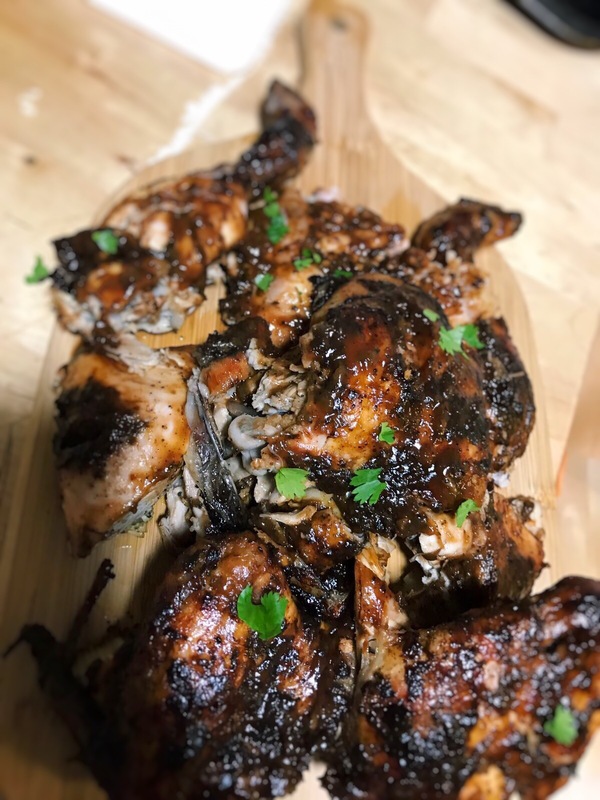 I thought this would be a great place to share some of the recipes so you can create a great feast for your friends too. A Nigerian staple at festive gatherings. To make the tomato pepper sauce, add 1 can of chopped tomatoes, red bell peppers, scotch bonnet pepper and 1 onion to a blender and blend until smooth. Set aside for later. Note: To help with the blending process, you can add a little bit of water, if needed. Dice another onion into really small pieces. Heat oil in a pot. When the oil is hot enough, add the onions and fry on medium heat for about 3 minutes, or until they appear translucent. Add tomato puree to the pot and fry with the onions on medium heat for 5 minutes. Tip: Stir frequently to prevent the paste from burning. Add the tomato pepper sauce and stir well. Season the sauce by adding bay leaves, dried thyme, korr chicken stock cubes, all-purpose seasoning and salt, to taste. Stir very well, cover and leave to boil on medium heat for about 15 minutes. Note: For reference, I used 2 knorr cubes and 1.5 tbsp of all purpose seasoning. Parboil the rice by washing the rice with cold water to remove some of the starch and place in a pot. Add some water, about twice the level of the rice and boil the rice to a stage where the rice is not completely cooked but also not hard either. After this, add in just enough water to cover the rice, so the water should be just above the level of the rice. Cover and leave the Jollof rice to cook on a very low heat. Stir the jollof rice every 20 minutes and cover again until it is cooked. After steaming on low heat for a total of approximately 1 hour and 15 minutes, the jollof rice should be ready. 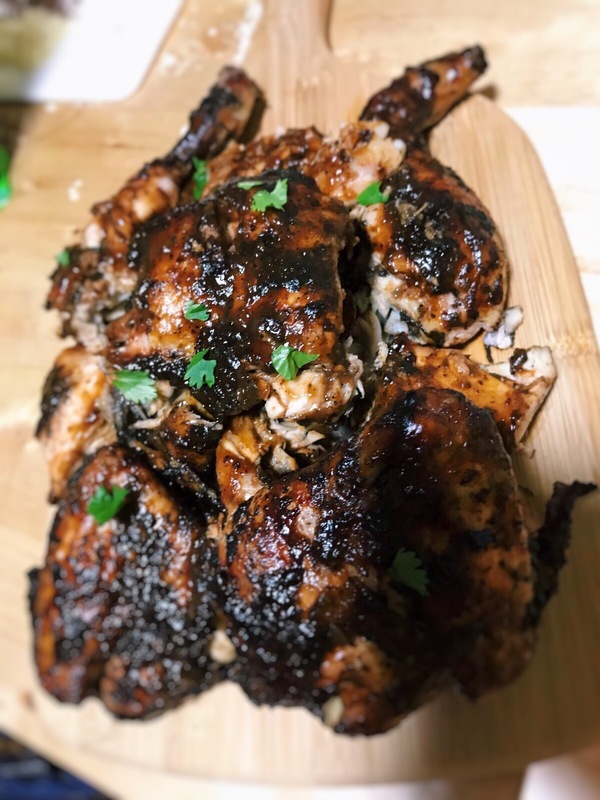 This was definitely my favourite dish I made that day, it’s not authentic jerk chicken per say but it was near good enough and very delicious. 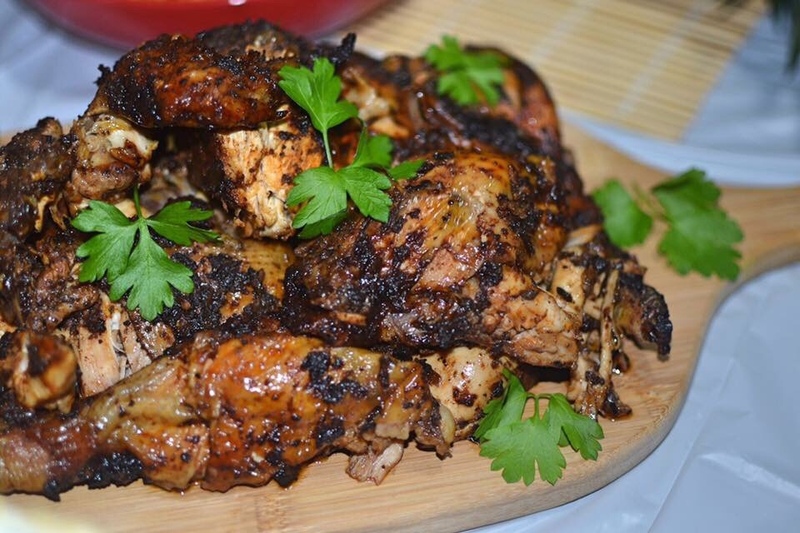 The jerk chicken was inspired by fellow food blogger, Malaika’s easy oven jerk chicken recipe. 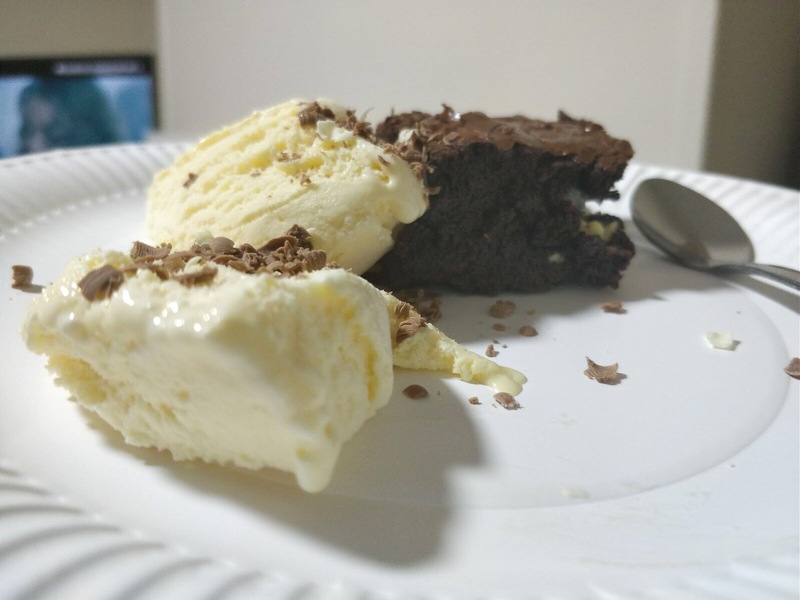 Something sweet, easy and quick to make. Wash, dry, and season the chicken legs with the salt, garlic, pepper, cayenne and paprika. Place chicken legs on a baking tray and cook in the oven for about 35-40 minutes, turning once half way through the time. While they are baking, make the bbq sauce by mixing the remaining ingredients together. Use a brush to generously coat both side of drumsticks with the sauce and place them back in the oven for another 5-10 minutes. You can’t have jollof rice, without some fried plantain! Slice the plantains at an daiagonal angle, ensuring each piece is cut evenly. Heat oil on medium heat. Put enough oil in the frying pan to coat the bottom of the pan. When the oil gets hot, add plantains and fry on both sides until dark golden color. Then remove from the oil and drain on a paper towel. This was made by my lovely work friend who followed the recipe below. Loved the spicy kick to this dish. Extra chocolatey, gooey, soft but chewy brownies for my sweet tooth friends. Break up the dark chocolate. To save time, put dark chocolate in a heatproof bowl and warm in the microwave to melt. At 30 second intervals, stir the chocolate and microwave again until completely melted. In another bowl, whisk butter and sugar until fluffy. Gradually beat in the eggs, then add the vanilla essence. Spoon the cooled melted chocolate onto the mixture then mix in thoroughly. Sift the flour and cocoa powder onto the mixture and gently stir in. 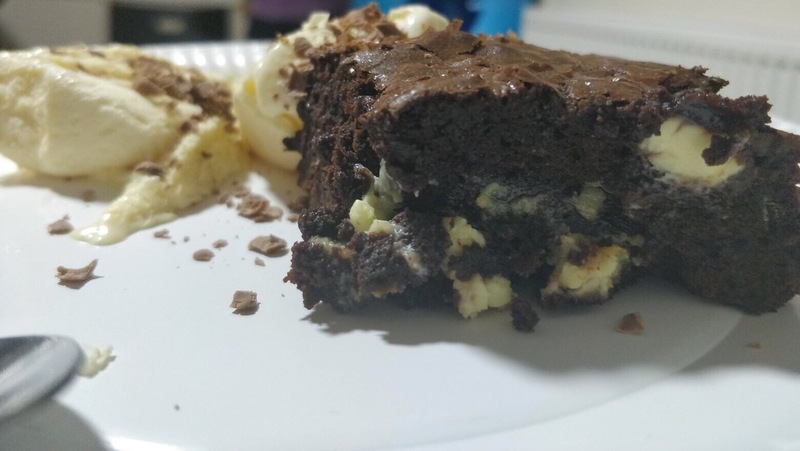 Using a knife, chop the white and milk chocolate into chunks and pour into the brownie mixture. 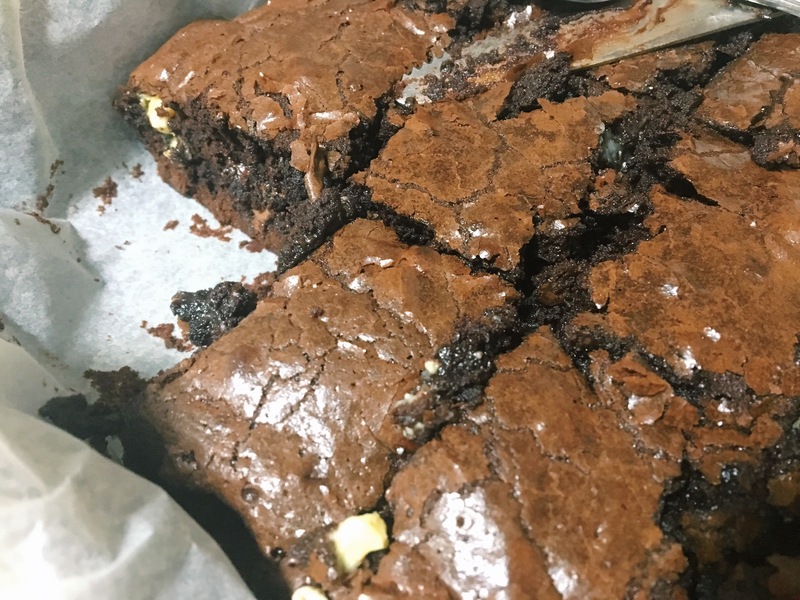 Bake in the heated oven for about 25 mins until the chocolate brownies are firm but still slightly soft and fudgy inside. Serve warm, with ice cream of choice. If you use my recipes, tag me on instagram or twitter, as I would love to see your pictures. For further assistance in making any of the recipes, comment below or contact me via email. Enjoy! What’s your favourite dish to cook for your family and friends? Previous Post 40 Photos That Will Inspire You To Give Southeast Asian Cuisine a Try.